If, like thousands of CCW holders across the nation, you use Speer Gold Dots as your carry load, Lawman ammo is the perfect practice round for you. This particular Lawman variant comes in 9mm Luger with a 115 grain total metal jacket bullet and replicates the ballistic performance of the 9mm Parabellum Gold Dot 115 grain hollow point. Each case contains 1,000 rounds with 20 boxes of 50 rounds each. 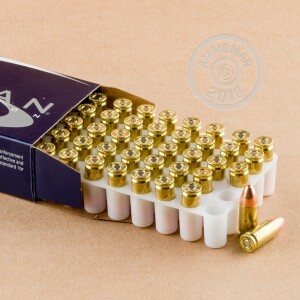 These rounds use CCI non-corrosive Boxer primers and reloadable brass cases. The total metal jacket (TMJ) plating used for Lawman ammo covers the base of the bullet to provide additional lead protection. While not suitable for use in ported barrels due to shearing issues, TMJ bullets are great for self-defense practice! 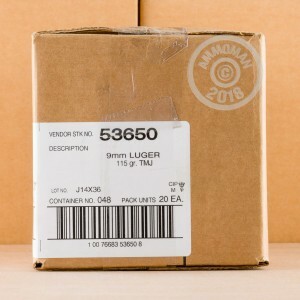 Get your 1,000 rounds of ammo shipped free to your doorstep, courtesy of AmmoMan's free shipping policy for all orders over $99. Not a fan of breathing lead cuz, you know, brain damage and stuff. Glad to see TMJ encased bullets. Hope this will continue to be available!!! GREAT product and GREAT company to do business with. No failure to feed/fire/eject after 600 rounds. Will be purchasing more from ammoman. Shot 300 rounds and every one performed very well. Will purchase more. Great product for the range!! My wife and I both carry SIG P938's. 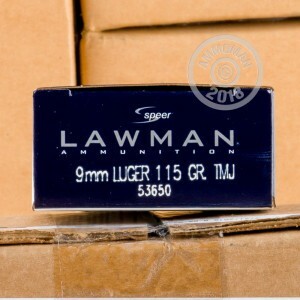 We have gone through more than 500 rounds each of the Speer Lawman 9mm with no failures, misfires jams etc. They are accurate and build confidence. You can't find better range ammo. Great quality at an affordable price.